"My Spanish husband taught me this delicious recipe. You can also use lemon juice in place of the vinegar." 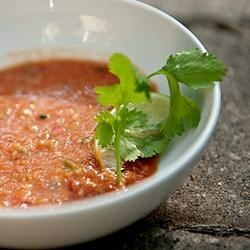 Combine the tomatoes, green onions, cucumber, bell pepper, and water in a blender; blend until smooth. Add the vinegar and olive oil; blend again until well integrated. Season with salt and pepper to serve. I did not enjoy this recipe at all. All I could taste was the onions. save the spoon and serve this in a glass with a sprig of cilantro. (we added that and fresh cracked pepper.) this will be a weekly staple around here!